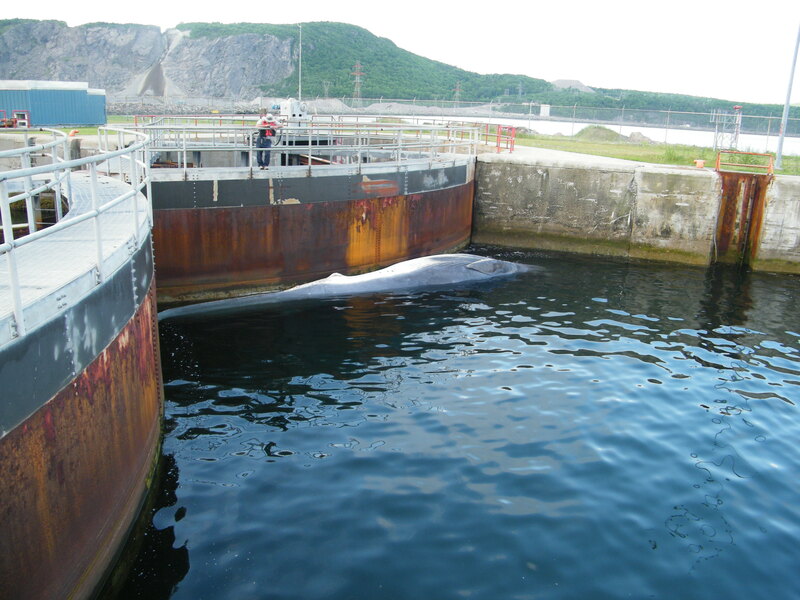 On July 3, 2014, a dead, 17 m, juvenile fin whale drifted from the west side onto the Canso Causeway, between Cape Breton Island and mainland Nova Scotia. The causeway’s gates were opened to allow the whale to drift through, but on July 5 it was blown onshore on the east side of the causeway by post-tropical storm Arthur. It is always a challenge, logistically and financially, to dispose properly of such a large carcass, let alone to perform a necropsy to try to determine the cause of death. Depending on the location and circumstances, different Departments (federal, provincial, municipal) may inherit the responsibility to dispose of the carcass, and special arrangements (assembling a team of prosectors, securing access to heavy equipment) need to be made if there is agreement to do a necropsy. 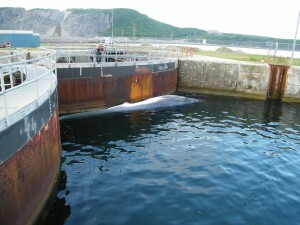 In the end, after having undergone substantial decomposition, the carcass was towed for 25 km to a burial site, and on July 12, thanks to the Marine Animal Response Society (MARS) of Nova Scotia, and with the cooperation of Nova Scotia Department of Natural Resources and of Fisheries and Oceans Canada, a complete necropsy was performed, involving 10 volunteers and a heavy equipment operator. There was no evidence that this whale had become entangled in fishing gear, and the complete absence of traumatic injuries such as broken bones ruled out the possibility of a ship strike. However, there was some suggestion, based on the blubber thickness of this animal, that it was in poor body condition and that it may have died from emaciation/starvation.